A study conducted by researchers at the Plant Molecular and Cellular Biology Institute (IBMCP), a joint venture of the Universitat Politècnica de València and the Spanish National Research Council (CSIC), reveals how genetically modified tomato plants have increased resistance towards Tuta absoluta insect plagues. The researchers turned to genetic engineering to strengthen the tomato plant by giving it defensive genes such as the protease inhibitors in barley. A serine proteinase inhibitor (BTI-CMe) and a cysteine proteinase inhibitor (Hv-CPI2) were investigated, isolated from the barley plant, on the Tuta absoluta insect. 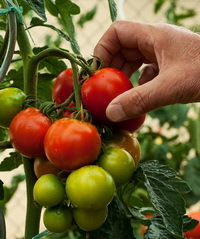 Both inhibitors were tested separately, as well as together in transgenic tomato plants. The Tuta absoluta larvae which were fed the double transgenic plants showed noticeable weight loss, and only 56% of the larvae reached their adult stage. Those that reached their adult phase had wing deformities and fertility reduction.